Born in Liverpool, in 1943, Harrison’s earliest influences were jazz guitarist Django Reinhardt and blues man Big Bill Broonzy, though he also loved the ukulele and comedy vignettes of George Formby. A passion for Elvis Presley gave George his entre into the world of rock’n’roll, while he was also a devotee of country twang, with Chet Atkins and Carl Perkins top of his list of favourite artists from the era before The Beatles changed everything. Paul McCartney took George along to an audition for John Lennon’s Quarrymen in 1958, and, upon reaching the age of 15, he was accepted as a full-time member. When The Beatles played in Hamburg, 17-and-a-half-year-old George was there to soak in the music he heard from other aspiring groups, as well as becoming road-honed, along with the rest of The Quarrymen. Nor should it be forgotten that, as The Beatles played multiple sets in the Hamburg clubs, it was not just John and Paul that were fulfilling the role of lead vocalist. Night after night, George sang ‘Roll Over Beethoven’, ‘Everybody’s Trying To Be My Baby’, ‘Nothin’ Shakin’ But the Leaves On A Tree’ and Tommy Roe’s ‘Sheila’. It would be pointless to retell the story of The Beatles and to constantly place George within the narrative, but George’s songwriting contributions bear revisiting. After ‘Don’t Bother Me’, it took two years for one of George’s songs to appear on a Beatles album; the soundtrack to the film Help!, released in August 1965, boasted two: ‘I Need You’ and ‘You Like Me Too Much’. The former, in particular, gives us an indication of George’s ability to write beautiful love songs that were rarely straightforward, but always heartfelt. Issued the following year, Rubber Soul includes ‘Think For Yourself’, the first of George’s songs that wasn’t a love song. The second of George’s tracks on this album is ‘If I Needed Someone’, something of a musical coda to Help!’s ‘I Need You’. In August 1966, three of George’s songs appeared on the band’s ground-breaking Revolver, adding crucial elements that made the album such a progressive and special record: there’s the brilliant ‘Taxman’, with its iconic bassline, while ‘Love You To’ uses Indian instruments. (It was in October 1965 when George played a sitar on ‘Norwegian Wood (This Bird Has Flown)’, for Rubber Soul; ‘Love You To’ expanded upon this to include tabla, a pair of hand-drums, sitar and a tambura that provided the drone, making it the first Beatles song to fully reflect the influence of Indian classical music. ‘I Want To Tell You’ is the third of Harrison’s Revolver compositions and is another song with a less than traditional structure, revealing George’s considerable creativity, both lyrically and musically. 1967’s Sgt Pepper’s Lonely Hearts Club Band only featured one Harrison original – another Indian-influenced number which was, according to John Lennon, one of his best: ‘Within You Without You’. That same year, on the soundtrack to Magical Mystery Tour, George contributed the delicate ‘Blue Jay Way’. In March 1968, The Beatles released ‘Lady Madonna’ as a single, with George’s ‘The Inner Light’ on the B-side, featuring lyrics that are a rendering of the 47th chapter of the Tao Te Ching. The instrumental track was recorded in Bombay (Mumbai), India, in January 1968, during the sessions for Harrison’s debut solo album, Wonderwall Music. The Beatles’ 1968 album that we’ve all come to call “The White Album” contains four Harrison songs, including one of George’s towering achievements. “I wrote ‘While My Guitar Gently Weeps’ at my mother’s house in Warrington,” he said. “I was thinking about the Chinese I Ching, the Book Of Changes… The Eastern concept is that whatever happens is all meant to be, and that there’s no such thing as coincidence – every little item that’s going down has a purpose.” The album also includes ‘Piggies’, a song George originally wrote in 1966, ‘Long, Long, Long’ and ‘Savoy Truffle’, the latter is a song about Eric Clapton’s fondness for sweets. The two songs written by George for the Yellow Submarine soundtrack are ‘Only A Northern Song’ and ‘It’s All Too Much’. In early summer 1969, The Beatles released ‘The Ballad Of John And Yoko’ as a 45, with another of George’s songs, ‘Old Brown Shoe’, on the flip. It was very much a precursor to what would follow. Issued in 1969, Abbey Road contained one of George’s standout numbers – and one of the finest songs on the album – ‘Something’, though ‘Here Comes The Sun’ is certainly worthy of accolades as well. With George well into his stride, two more Harrison compositions made it onto The Beatles’ final album, Let It Be: ‘For You Blue’ (also the B-side of ‘The Long And Winding Road’ in the US) and ‘I Me Mine’, the last new song recorded by The Beatles before they formally split. George more than most would have appreciated the irony. George’s solo songwriting contributions to The Beatles’ catalogue, while clearly fewer in quantity than either John or Paul’s, more than held their own in terms of quality. A chronological listen to those tracks alone reveal how Harrison grew as a writer, and how his contributions, way more than the “one per album” assumption of lazy historians, also helped complete many of The Beatles’ albums. In fact, George was so productive that his first two solo albums also date from his Beatle days. 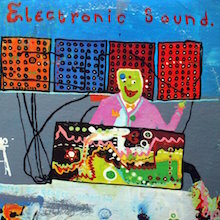 Wonderwall Music and Electronic Sound, the latter a disc much loved by The Chemical Brothers, may once have been considered curiosities, but they still repay rediscovery, having been largely overlooked since their release, in 1968 and 1969, respectively. Turns out that George was ahead of his time. The former combines a fusion of Western and Eastern music while the latter is comprised of two lengthy Moog synthesiser pieces: ‘Under the Mersey Wall’ and ‘No Time or Space’, where George is guided by the Moog wizard Bernie Krause. All Things Must Pass (1970) could not be more different. Released as a triple-LP box set, it remains a staggering achievement. Utilising the skills of Eric Clapton, along with Bobby Whitlock, Jim Gordon and Carl Radle (who, collectively, would go onto to become The Dominos to Eric’s Derek), Badfinger, Ringo Starr, Klauss Voormann, Billy Preston, Ginger Baker and Pete Drake, among others, the songs within reflect a total contrast to The Beatles’ music, as George created one of the truly great albums. ‘My Sweet Lord’, ‘Ballad Of Sir Frankie Crisp (Let It Roll)’, ‘Behind That Locked Door’, the beautiful ‘Isn’t it A Pity’, ‘Apple Scruffs’, the supercharged ‘What Is Life’, ‘Beware Of Darkness’ and the title track: all are classics. Additionally, there’s, ‘I'd Have You Anytime’, a song written with Bob Dylan, along with a Dylan cover, ‘If Not For You’ – both beautifully realised. And then there’s the vastly underrated ‘Let It Down’, the lovely ‘Run Of The Mill’ and the uplifting ‘Awaiting On You All’… Few albums are solid gold from first track to last, but All Things Must Pass is one of them. ‘My Sweet Lord’ has the distinction of being the first No.1 single in both the UK and US to be released by a former Beatle, as well as being the UK’s biggest-selling single of 1971. George wrote the song, but did you know that he was not the first to record it? He actually gave the song to Billy Preston, who included it on his September 1970 album, Encouraging Words that George also produced. It was Madeline Bell who asked US soul singer Doris Troy to help out with the vocals on Billy Preston’s debut Apple album, That’s The Way God Planned It, which led to Doris signing to Apple herself and recording a solo album that George Harrison co-produced at Trident and Olympic Studios in London. Harrison co-wrote four of the songs on Doris Troy, as well as arranging the traditional ‘Jacob’s Ladder’. When the album was reissued, Troy said, “Doing that album was a reminder that ‘soul’ didn't have a color.” Amen to that. As an adjunct to this ground-breaking All Things Must Pass, the following year’s The Concert For Bangladesh gathers together many of the former album’s participants on another epic triple-disc set, with Ravi Shankar opening proceedings for his protégé and Dylan bossing Side Five. The highlights include a selection of All Things Must Pass songs and Ringo Starr’s ‘It Don’t Come Easy’, as well as a lovely take on ‘Here Comes The Sun’. There’s also a superb version of ‘While My Guitar Gently Weeps’, with Eric Clapton to the fore – as he was on the original recording. Just one listen to the album’s title track, a hit single for George, will remind you of the kind of night you missed if you weren’t there, but can recapture through the sheer joy of this live album. On both his early 70s outings, George shared production with Phil Spector, whose dense Wall Of Sound technique is considerably cleaned up in the remastered, reissued albums. For Living In The Material World, George took over the producer’s role and offers us the heartfelt ‘Give Me Love (Give Me Peace On Earth)’. On this album, George also delivers some stunning lead guitar work, as well as writing two of his most seductive songs, ‘Don’t Let Me Wait Too Long’ and ‘Be Here Now’: 24-carat masterpieces. 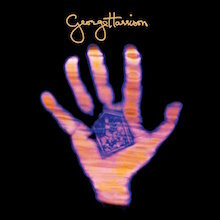 Lovely meditative music is, of course, George’s forte and his insistence on putting across a non-threatening faith and spirituality pervades much of his best work. Its follow-up, Dark Horse, is something of a departure from that mode, as it chronicles a period of personal and professional upheaval in George’s life. Includes the lovely ‘Maya Love’ and the more raucous, but fabulous, Ron Wood collaboration, ‘Far East Man’, it boasts a cast of top session men – including Jim Keltner, Willie Weeks, Tom Scott and Andy Newmark among them – ensuring a slick sound that epitomises the LA scene of 1973/74. George began working on his next album in April 1975. Released in September that year, Extra Texture (Read All About It) includes his gorgeous tribute to Smokey Robinson, ‘Ooh Baby (You Know That I Love You)’, a track that sets the template for the rest of the album. This is George’s “soul record”, in that he both bares his soul and takes a more soulful approach to the music. It’s one thing to find such an inspirational text (one that George apparently was mindful of during some of the difficult times he experienced while The Beatles were breaking up), but it’s quite another to be able to put it to such a lovely melody. ‘The Answer’s At The End’ benefits greatly from a lovely David Foster string arrangement, but most of all from George’s brilliant piano playing. It’s hands-down a contender for George’s greatest, most overlooked recording. And that’s not all… Extra Texture also includes fabulous ‘This Guitar (Can’t Keep From Crying)’ and ‘You’, the latter released as a single, two weeks ahead of the album’s release. When the album came out in the US, in late September 1975 (it was issued two weeks later in the UK), it failed to receive universal acclaim – in fact just the opposite. But the fact is, it’s a grower: one that has stood the test of time far better than many of George’s contemporaries’ offerings from the middle years of that strange decade. If you’ve overlooked this album, give it a listen… and remember: once is never enough. 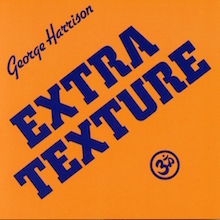 Extra Texture (Read All About It) was George’s final album for Apple Records. The follow-up, his seventh solo long-player, came out a year later, in November 1976; Thirty Three & 1/3 was released on Harrison’s newly formed Dark Horse Records. Despite George being ill with hepatitis during its making, it’s proved to be an enduring record, full of great songs and, in some cases, dark humour – in particular ‘This Song’, a satire on the court case surrounding ‘My Sweet Lord’. 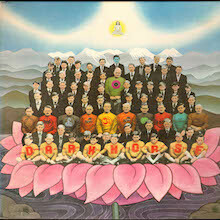 Two and a half years later, the self-titled George Harrison became his second Dark Horse release. Recorded after George’s marriage to Olivia, it’s a pure reflection of their love, opening with the heartfelt ‘Love Comes To Everyone’, and includes another song about his bliss, ‘Dark Sweet Lady’. There’s also ‘Not Guilty’, a song that George had originally recorded a decade earlier during the making of “The White Album”, and ‘Blow Away’, which became a Top 20 hit in the US – an example of George’s ear for a great hook. In 1981, George released Somewhere In England, his first album in two years and his first new music since the tragic death of John Lennon. It also reflected his difficulties working with Warner Bros Records, who distributed George’s Dark Horse imprint. Despite these potential setbacks, it included one of Harrison’s biggest hit singles, ‘All Those Years Ago’, a tribute to Lennon that featured Ringo Starr on drums, as well as Paul and Linda McCartney and Denny Laine on backing vocals. 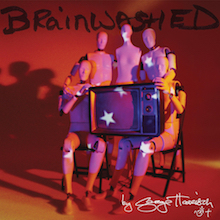 A little over a year later, Gone Troppo emerged as George’s 10th studio album, and his last under contract with Warner Bros. It’s far from George’s finest moment, and arguably suffers from the musical mood pervading the early 80s. Lead single ‘Wake Up My love’ is a good example of George trying to write a song that was contemporary, rather than focusing on what he was really great at. But, for all that, there are some lovely moments, including ‘Mystical One’ and ‘Unknown Delight’ – both proving that a record company can’t keep a great songwriter down. It would be five years before George put out another solo album and, when he did, it was a serious return to form. Cloud Nine includes ‘Got My Mind Set On You’, a song not written by George (it was originally released by James Ray, in 1963), but one which he wholly makes his own; it became his third No.1 single. The parent album was co-produced with ELO’s Jeff Lynne, who also co-wrote three of the tracks, including, ‘When We Was Fab’, another hit single and another hark back to George’s Beatles’ days. The album went Top 10 in both Britain and America. Perhaps inspired by thoughts of his time in a band, Harrison formed The Traveling Wilburys with Jeff Lynne, Roy Orbison, Bob Dylan and Tom Petty. This most super of supergroups came about after the individuals convened at Dylan’s home to record a song for a single for George. ‘Handle With Care’ was, however, just so good that they carried on and recorded an entire album together. The Traveling Wilburys Vol 1 went on to win a Grammy and is one of those albums that should be in everyone’s collection: it’s consummate, collective songwriting of the highest order. Shortly after the album’s release, Orbison tragically died of a heart attack. Two years later, the remaining members released the deliberately misnumbered Traveling Wilburys Vol 3. During this period, George also played on Dylan’s Under The Red Sky and worked on Lynne’s Armchair Theatre, both released in 1990. In 1991, George went on the road with a band that included Eric Clapton, Andy Fairweather Low, Nathan East, Greg Phillanganes and Chuck Leavell, and the resulting live double-album, Live In Japan, is a journey through George’s Beatles career and his solo work. It serves as a fulsome reminder of what a great songwriter George Harrison is, was, and always will be. In 1994, with work underway on The Beatles’ Anthology project, George got together with Ringo and Paul to work on a song fragment originally written by John Lennon. The result was 1995’s ‘Free As A Bird’, the first new material in 25 years to be credited to all four Beatles. It was followed by ‘Real love’, released the following year and included on Anthology 2. In 1997, George was diagnosed with throat cancer and treatment appeared to be a success. In 2001, however, it was revealed that the cancer had spread. George Harrison passed away on 29 November 2001 and, according to Hindu tradition, his ashes were scattered in the Ganges and Yamuna Rivers near Varanasi, India, by his close family. There is a Hindu proverb that says: “There is nothing noble in being superior to some other person. True nobility comes from being superior to your previous self.” It would be too trite to say that George’s solo career was superior to that during his time with The Beatles, yet, as both an artist and a man, he continued to grow. “When you were born, you cried and the world rejoiced. Live your life in such a manner that when you die, the world cries and you rejoice,” is another Hindu proverb. We cried, and yet we rejoiced at the nobility of George Harrison’s life. Without a doubt, Harrison's first solo recording, originally issued as a triple album, is his best. Drawing on his backlog of unused compositions from the late Beatles era, George crafted material that managed the rare feat of conveying spiritual mysticism without sacrificing his gifts for melody and grand, sweeping arrangements. Enhanced by Phil Spector's lush orchestral production and Harrison's own superb slide guitar, nearly every song is excellent: "Awaiting on You All," "Beware of Darkness," the Dylan collaboration "I'd Have You Anytime," "Isn't It a Pity," and the hit singles "My Sweet Lord" and "What Is Life" are just a few of the highlights. A very moving work, with a very significant flaw: the jams that comprise the final third of the album are entirely dispensable, and have probably only been played once or twice by most of the listeners who own this record. Those same jams, however, played by Eric Clapton, Carl Radle, Bobby Whitlock, and Jim Gordon (all of whom had just come off of touring as part of Delaney & Bonnie's band), proved to be of immense musical importance, precipitating the formation of Derek & The Dominos. Thus, they weren't a total dead end, and may actually be much more to the liking of the latter band's fans. How does an instant multimillion-selling album become an underrated minor masterpiece? 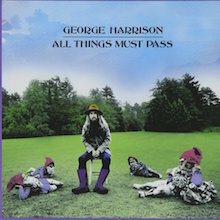 George Harrison's follow-up to the triple-disc All Things Must Pass (which had been comprised of an immense backlog of great songs that he'd built up across the last years of his time with the Beatles), Living in the Material World was necessarily a letdown for fans and critics, appearing as it did two-and-a-half-years after its predecessor without that earlier album's outsized songbag from which to draw. And it does seem like Harrison narrowed his sights and his vision for this record, which has neither the bold musical expansiveness nor the overwhelming confidence of its predecessor. And while there are still some beautiful and delightfully lyrical, charming moments throughout, few of the melodies are as instantly memorable and compelling as those of most of the songs on the earlier record, and some of the most serious songs here, such as "The Light That Has Lighted the World," seem weighed down with their own sense of purpose, in ways that All Things Must Pass mostly (but not entirely) avoided. What Living in the Material World does show off far better than the earlier record, however, is Harrison's guitar work -- unlike the prior album, with its outsized contingent of musicians including Eric Clapton and Dave Mason on guitars, he's the only axeman on Material World, and it does represent his solo playing and songwriting at something of a peak. Most notable are his blues stylings and slide playing, glimpsed on some of the later Beatles sessions but often overlooked by fans. "Don't Let Me Wait Too Long" is driven by a delectable acoustic rhythm guitar and has a great beat. The title track isn't great, but it does benefit from a tight, hard, band sound, and "The Lord Loves the One (That Loves the Lord)," despite its title, is the high point of the record, a fast, rollicking, funky, bluesy jewel with a priceless guitar break (maybe the best of Harrison's solo career) that should have been at the heart of any of Harrison's concert set. Vocally, Harrison was always an acquired taste, and he isn't as self-consciously pretty or restrained here, but it is an honest performance, and his singing soars magnificently in his heartfelt performance on "The Day the World Gets Round," a song that resembles "Beware of Darkness" and also, curiously enough, "Across the Universe." Perhaps a less serious title would have represented the album better, but nobody was looking for self-effacement from any ex-Beatle except Ringo (who's also here, natch) in those days. Even in the summer of 1973, after years of war and strife and disillusionment, some of us were still sort of looking -- to borrow a phrase from a Lennon-McCartney song -- or hoping to get from them something like "the word" that would make us free. And George, God love him, had the temerity to actually oblige, to the extent of painting a few signs here and there suggesting where he'd found it and where we might, all with some great playing and some laughs. And it wasn't all serious -- there are pointed moments of humor throughout, especially on the title song; and "Sue Me, Sue You Blues" was a follow-up to Beatles-era tracks such as "Only a Northern Song," dealing with the internal workings and business side of his lingering involvement with the group, in this case the multiple, overlapping, sometimes rotating lawsuits that attended the breakup of their organization. And one track, "Try Some, Buy Some," which he'd given away to Ronnie Spector at the time, actually dated back to the All Things Must Pass sessions. Despite George Harrison's reputation for solemn, lugubriously paced albums in the early '70s -- and this one is mostly no exception -- the jacket is full of jokes, from the eaten-away Apple logo (the Apple label would expire at year's end) to the punning title, the list of non-participants, and the mischievous grin of the ex-Beatle above the arch caption "OHNOTHIMAGEN" ("Oh, not him again!"). The record gets off to a great start with the instantly winning single "You" -- a bit of which is then repeated to open side two. But here, the basic idea and instrumental track come from February 1971, during George's most fertile period, dressed up with vocals and string synthesizer four years later. One of George's most beautifully harmonized, majestic, strangely underrated ballads "The Answer's at the End" -- whose inspiring lyric was based upon an inscription on George's home by its builder, Sir Frank Crisp -- comes next, followed by "This Guitar (Can't Keep from Crying)," an attractive sequel to "While My Guitar Gently Weeps." At this point, the devoted fan's hopes go up; could this be an unsung masterpiece? But George has fired off his best stuff first, and the record slowly and inexorably tails off, closing with a baffling salute to ex-Bonzo Dog Band member "Legs" Larry Smith. Yet despite its stretches of treadmill material, Extra Texture has worn better as a whole than its Apple neighbors Dark Horse and even much of Living in the Material World, for even the lesser tunes reveal a few musical blossoms upon re-listening and the front-loaded songs are among the best of his solo career. With his first solo tour looming ahead in November and December of 1974, George Harrison felt impelled to rush out a new album, and even a steadily worsening case of laryngitis wouldn't stop him. Would that it did, for the appallingly weak state of his voice would torpedo this album and the tour, to his great embarrassment. "Hari's on Tour (Express)" -- with Tom Scott's L.A. Express churning out all-pro L.A.-studio jazz/rock -- gets the doomed project off to a spirited start, but it's an instrumental, and Harrison's vocal distress becomes obvious to all in the next track, "Simply Shady." Some of George's tunes -- particularly the title track and the exquisite "Far East Man" -- might have benefited from waiting for a better time to record, while others probably could not have been saved. The recording quality, like the voice, has a raw, coarse-grained sound that belies the impeccable musicianship. Dark Horse is perhaps most notorious for Harrison's bitter, slipshod rewrite of the Everly Brothers' hit "Bye Bye Love" -- referring openly to George's wife Pattie running off with Eric Clapton and, for good measure, having both of them on the session! Dark Horse would also be the name of Harrison's soon-to-be-formed new label, as well as a metaphor for the underestimated Beatle who leaped artistically and commercially ahead of his three colleagues immediately after the Beatles' breakup. Unfortunately, this album -- despite its humorous Sgt. Pepper parody on the cover and outright plea to critics on the margins of the inside jacket to go easy on its contents -- would only undermine Harrison's hard-fought campaign for respect. 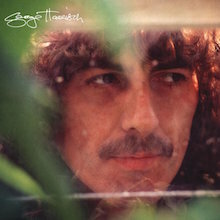 George Harrison is, except for the overdubbed London strings, a painstakingly polished L.A.-made product -- and not a particularly inspired one at that. It's an ordinary album from an extraordinary talent. "Love Comes to Everyone" leads it off on a depressing note, a treadmill tune with greeting-card verses, and there are too many other such halfhearted songs lurking here, although some are salvaged by a nice instrumental touch: a catchy recurring guitar riff on "Soft Touch" and some lovely slide guitar on "Your Love Is Forever." Compared to the original, tougher Beatles version that was left off the White Album, the remake of "Not Guilty" is an easy listening trifle, though it was a revelation when it came out (the original had to wait until 1996 and Anthology 3 for an official release), and the succeeding "Here Comes the Moon" is a lazy retake on another Beatles song. "Blow Away" would be the record's most attractive new song -- and a number 16 hit -- but "Faster," a paean to Harrison's passion for Formula One auto racing, probably better reflected where his head was at this time. There are a few quirks: "Soft-Hearted Hana" is a strange, stream-of-consciousness Hawaiian hallucination and "Dark Sweet Lady" is a Latin-flavored tune written for his new wife, Olivia. Finally, the inevitable spiritual benediction "If You Believe" offers some thoughtful philosophy to ponder, if not an especially memorable tune. George Harrison went quiet not long after the second Traveling Wilburys album, surfacing only for the Beatles' Anthology in the mid-'90s. He was recording all the while, yet he died before completing the album that would have been the follow-up to 1987's Cloud Nine. His son, Dhani, and his longtime friend/collaborator Jeff Lynne completed the recordings, released late in 2002, nearly a year after George's death, as Brainwashed. Given its baggage it's easy to be suspicious about the merits of Brainwashed prior to hearing it. Posthumous efforts often feel incomplete, Harrison's albums were frequently inconsistent, and Lynne favors ornate, cinematic productions that run contrary to George's desire for this project to be simple and low key -- nothing that would suggest that Brainwashed would be a success. Defying all odds, Brainwashed isn't just a success, it's one of the finest records Harrison ever made. No, it doesn't achieve the splendor of All Things Must Pass, nor is it quite of its time like both Living in the Material World and Cloud Nine were, but it's a quiet, subtle gem, one that strikes close to the heart of Harrison's music. It's intimate, alternately insightful and cheerfully lightweight, balancing his trademark black humor with silliness and good humor. Anyone searching the album for his views on mortality -- as he faced not only cancer, but an attacker that nearly took his life -- will surely find it, but this is not a somber album, it is a warm album, the sound of someone enjoying life without losing his wry sense of humor. This same spirit carries over to the music, with Harrison abandoning the idea of getting a hit and simply relaxing, primarily by playing a lot of ukulele and guitar. 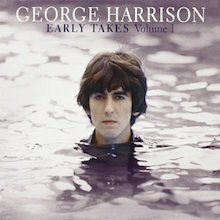 There aren't any major songs here and perhaps a tune or two could be pegged as throwaways by the cynical, but there are no down moments and it all holds together well -- better than most Harrison albums -- and it's a fitting way to say goodbye, every bit as good as Double Fantasy and, in some respects, even sweeter. Hard as it is to believe, George Harrison, guitar picker, was also an electronic music pioneer, as these two lengthy, abstract tone poems for early-vintage Moog synthesizer reveal. A naif in the electronic sphere, George had a lot of help putting this music together, particularly from ace California electronic composer Bernie Krause. (Interestingly, Krause was originally given prominent credit in the artist's childlike artwork on the LP cover, but when the album came out, Krause's name was almost, but not quite, obscured by silver paint, and the CD erases it entirely.) The main difference between the CD reissue and the original LP is that the identities of the two works apparently have been reversed; "Under the Mersey Wall" is really "No Time or Space" and vice-versa. Accordingly, Krause is given "assistance" credit for the latter piece instead of the former, which is significant because "No Time or Space" is the masterpiece of the record. Dramatically structured, unearthly in its pitchless writhing, flamboyantly manipulating pink and white noise from the opening electronic gun battle onward, "No Time or Space" is still an entertaining listening experience, and some of its passages would turn up later in the "I Remember Jeep" jam from Harrison's All Things Must Pass album. The shorter "Mersey Wall," recorded in Harrison's Esher bungalow with his own Moog, is a low-key, drifting affair, not quite as virtuosic in its handling of abstract sound, nor nearly as theatrical. Though scoffed at when they were released, these pieces can hold their own and then some with many of those of other, more seriously regarded electronic composers. And when you consider that synthesizers were only capable of playing one note at a time and sounds could not be stored or recalled with the push of a button, the achievement becomes even more remarkable. Alas, George never followed up on this direction, which, like the Zapple label, was abandoned after this release. 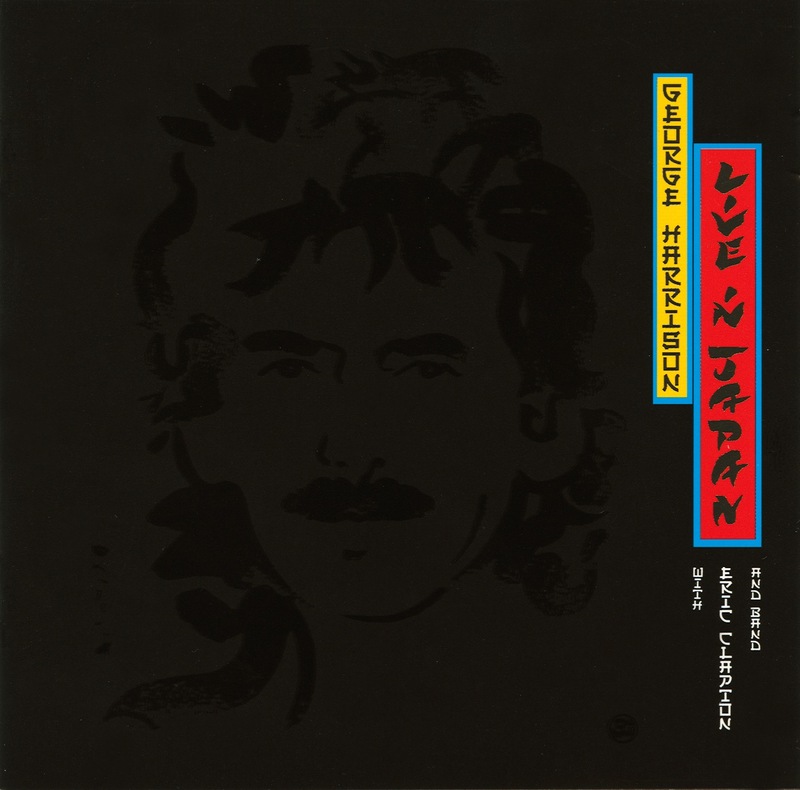 George Harrison returned to the stage for the first time in years in 1991; that Japanese tour is documented on the fine double-disc set Live in Japan. Backed by a stellar supporting band led by Eric Clapton, Harrison turns in surprisingly strong versions of his best solo material; it easily surpasses Paul McCartney's double-disc Tripping the Live Fantastic or Paul Is Live. Not bad for a guy who doesn't like to give concerts. 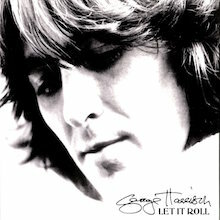 George Harrison had two periods of great commercial success, separated by 15 years and two record labels, which is why there hasn't been a career-spanning Harrison collection until 2009's Let It Roll:The Best of George Harrison, the first disc to gather songs from Harrison's stints at both Apple and Dark Horse. Let It Roll balances these two periods, mixing it all up chronologically, so the set starts with the pristine bounce of "Got My Mind Set on You" before giving way to "Give Me Love (Give Me Peace on Earth.)" If anything jars, it's the sounds of the times, as Jeff Lynne's clean arrangements don't necessarily fit with Phil Spector's lush productions, but that's a minor quibble about a compilation that consolidates Harrison's signature tunes onto one very enjoyable disc. Originally released as part of the deluxe Blu-ray edition of Martin Scorsese's 2011 documentary George Harrison: Living in the Material World, the 2012 disc Early Takes, Vol. 1 rounds up ten of George Harrison's demos dating from the '70s. The exact dates are fuzzy, as the liner notes are little more than hagiography, but a quick scan of the titles pegs the great bulk of them -- six, to be precise -- from All Things Must Pass, with two others dating from 1976's Thirty Three & 1/3 ("Let It Be Me," "Woman Don't You Cry for Me), another from Living in the Material World, the 1973 album ("The Light That Has Lighted the World), and, finally, a perfectly fine cover of Dylan's "Mama, You've Been on My Mind." Several of these are solo acoustic demos, some are rough band run-throughs, and nothing is all that far removed from the finished product, so the collection winds up just a tad anticlimactic for containing nothing but unreleased music: it all feels cozy. And while it's hard not to wish there were a surprise or two along the way, the familiar warmth certainly has its charms, too.